New Delhi: Imparting of Quality Education to Students is the crux of the learning outcome process for which we have to strive continuously and it is the Teacher as well as Parents, concerned departments, Educationist and the society in general has to work collectively. Our Government has now chartered the modalities of learning outcome process. Addressing a three day national conference on innovation (Navonmesh) in school education here at NCERT headquarters New Delhi today, Union Minister of Human Resources Development, Shri Prakash Javadekar emphasised the need to impart quality Education to students in such a manner so that they could come up as good citizens imbibed with values. 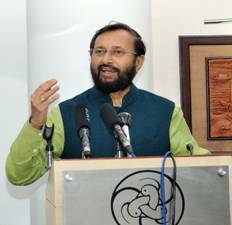 Shri Javadekar said we are planning to create awareness among parents and teachers as well as students regarding the norms of education being given at certain level in definitive mode. For this posters will be displayed in school across the country. Teacher will be provided proper training and accountability will be fixed. He said our Government has drawn up the learning outcome charter to improve and ensure the quality of Education. The Minister said five camps will be organized for innovations in education under the Navonmesh this year at Raipur, Bengaluru, Chandigarh, Guwahati and Pune where the aspects of teacher education, imparting of quality education, collaboration of community and proper use of digital means for education will be discussed at length by various state government officers, NGOs and exponent of education doing innovation in education. The Minister expressed the hope that deliberations at this conference will lead to constructive education for the empowerment of students so that they could attain knowledge, skill and good values in one go. We will circulate the resolution drawn here to everyone in due course, the Minister added. On this occasion five books were also released. They are; Learning Outcomes at the Elementary Stage, North-East India: People, History and Culture, Barakha: Reading Series for all, Towards Green School (In Hindi also as titled Haritshalaki ore) and Dictionary of Geography for Schools (Trilingual). The conference was addressed by Shri Anil Swarup, Secretary School Education, HrushikeshSenapati, Director NCERT and Mr. Shigeru Aoyagi, Director and UNESCO representative. The three day conference has participants from different states and UNESCO in addition to NGOs and Educationists.